Happy Music Therapy Awareness Month! Tuesday, Mar 15, 2016Incase you weren’t aware, March has officially been deemed Music Therapy Awareness Month by Health Canada! 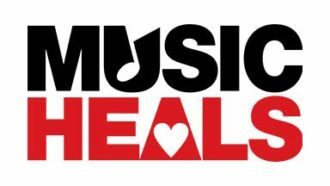 The team here at Music Heals has been working hard to make this a reality and it’s finally paid off! This is a HUGE step in helping music therapy gain momentum in the public eye! To celebrate this, I’ve been putting together some music therapy terms for you. I didn’t coin or define any of them myself. These are all official terms which have been taken from the International Dictionary of Music Therapy, edited by Kevin Kirkland. Advocacy of this profession has been important to me since I discovered it in 2010. That was the year that I started my travels to get where I am today. Now, I am in the last few months of my internship and almost at the point of being a certified music therapist and I couldn’t be more excited! Over the years, I have learned that one of the most frequently asked questions of this job is, “What is music therapy?”. So to answer this question, I’ve asked a few of the MTs I know to help me tell you! Hopefully this post has given you some new information and will inspire you to learn more 🙂 Enjoy! Music Therapy is the clinical use of music and the relationship between a therapist and client to help promote personal growth. Music therapist: A musician who is trained in the use of music as a therapeutic tool. 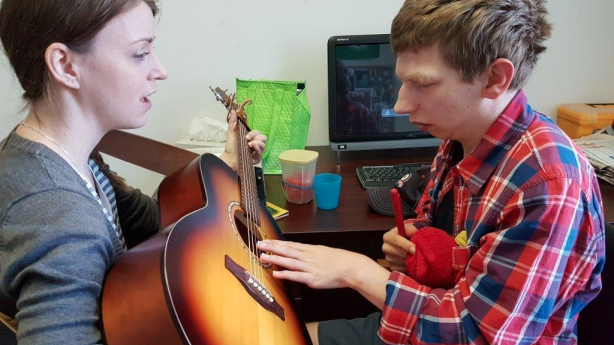 The music therapist supports the client throughout this process and creates a personalized plan with things such as improvisation, song writing, pre-composed music or a number of other interventions. Intake: The initial meeting of a client and therapist to share info, give an overview of services and discuss some desired outcomes of therapy. Ongoing assessment – Completed frequently to assess evaluate the process. Areas of assessment can include behavioural, musical, cognitive, social, physical, emotional, spiritual, educational and communicative. Goals: The desired outcome of a music therapy intervention. They are often long term but can also be in a session to session basis. They can range from emotional, physical, cognitive, spiritual, social, behavioural, musical or communication areas and can be addressed in a number of ways. Intervention: A strategic action plan which the therapist used to facilitate positive change in a client. These actions can include musical, verbal and non-verbal strategies. For example: song writing, improvisation, verbal counselling, etc. Documentation: Clinical notes reflecting the progress of sessions. This data includes evidence of change or maintenance of abilities. Circle seating: The physical set up of space is important aspect of sessions, so circle seating is often used. This allows everyone to see and hear each other equally, which encourages group participation. This set up also eliminates one person as being the focal point and allows all group members to be “co-participants”. Contact song: Typically at the beginning of session, it says “hello”, sets the tone and provides a secure base for the client. It often will become a ritual for group members as a point of building trust within sessions. Free play: Improvisation without guidelines. This can offer clients a sense of freedom by the acknowledging and respecting the client’s music but may not be conducive for those who benefit from structure and boundaries. Through this free expression, often an individual’s creativity is discovered and it may allow them to open up more so than speaking. This often will lead to a follow-up discussion and may provide another level of awareness in the client about their situation. Song parody: Therapeutic song writing approach where the lyrics of a pre-composed song are replaced by the client’s own words. This can be done in individual or group settings. Music life plan: a form of advanced music directive, which is written when a person is healthy, in order to articulate wishes that may be implemented in the event of a life change (such as terminal diagnosis). For example, the client chooses music aimed toward optimal states of relaxation, energy, etc, and then designs treatment plans for its use. It is then relayed to the medical team or family for later use. Song circle (aka soulsong circle): An a cappella vocal improvisation used to playfully explore sounds, feelings, role relationships and much more! Musical elements (pitch, rhythm, tempo, meter, etc) are layered and manipulated over a repeated rhythmic pattern. Lining out: Therapist leaves out the words/melody/rhythm at the end of a phrase in hopes to cue a client to fill them in. (E.g. Mary had a little…..”) This technique is used to support clients in the areas of memory, vocalization and participation. Song Collage: The use of words and phrases from prewritten songs as part of creating new lyrics in therapeutic songs. MT assists clients in assessing existing lyrics and finding ideas for including in their own song. These ideas may represent experiences, feelings or ideas they’ve had. All of these choose lyric fragments are put together along with original words, if desired, to form a new song. Drum play: Use of percussion for both musical and non musical experience. The physical, tactics and visual aspects are the focus for these activities. Crossing the midline: Looking, reaching or stepping across the midline of the body. This movement is very important for body-scheme development, bilateral and hand-eye coordination. This is usually achieved by the age of eight or nine. Midline inhibition is most often seen in children with Autism and individuals over the age of 65. Music therapy can address coordination goals through numerous activities such as playing the drum with one had as it moves across the body in the opposite direction, playing the xylophone from right to left, tossing a bean bag with your left hand to someone on your right, etc. Musical sedation: The use of live music tuned to someone’s vital signs with the intension of transitioning them from being awake to sleeping. Goodbye song: Usually the last song of a session. It is used to provide closure and often eases transitions for some clients. It is usually the same song each session to create stability. ISO principle: Mood or music of client matched by therapist to bring awareness to their state. After rapport is built, this state is either maintained to continue exploring or a therapeutic shift is guided by the therapist. 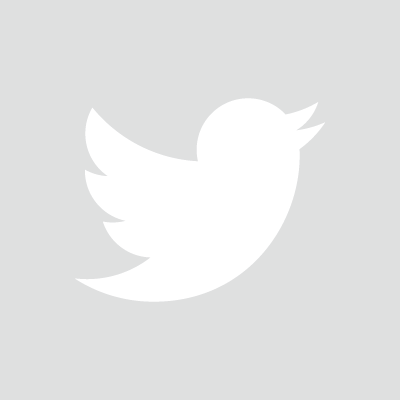 Entrainment: The synchronization of two things. In music therapy, this refers to the coming together of music & client (E.g. slow music creating relaxed heart rate). Psychoanalytical music therapy: A form of music centred psychotherapy; it is a client and therapist exchange through improvisation or listening. It uses the psychoanalytical framework which is based on theories from old school analysts like Freud. Reframing: Changing the musical background or environment to alter client’s playing. The MT does this when a client’s music is stuck or static. Resistance: The (often unconscious) behaviour which undermines a client’s goals. Usually surfaces as a defense against unwanted, unpleasant emotions and experiences associated with difficult times in the past. Music Therapists for Peace: A vision of the great, Edith Boxill. This idea came from a desire to expand her philosophy of a global awareness and belief that Music Therapists can use their skills to make contributions to world peace. Supervision: Intensive relationship in which the supervisor promotes and facilitates the development of therapeutic skills. This process often goes well beyond the student phase and continues through ones professional lifespan. Success oriented: Focusses on the client’s strengths rather than challenges. The music therapist will set challenging but attainable objectives so then client can reach their goal. This often helps clients focus on their abilities, which builds confidence with the hope of generalizing to other areas of their lives. 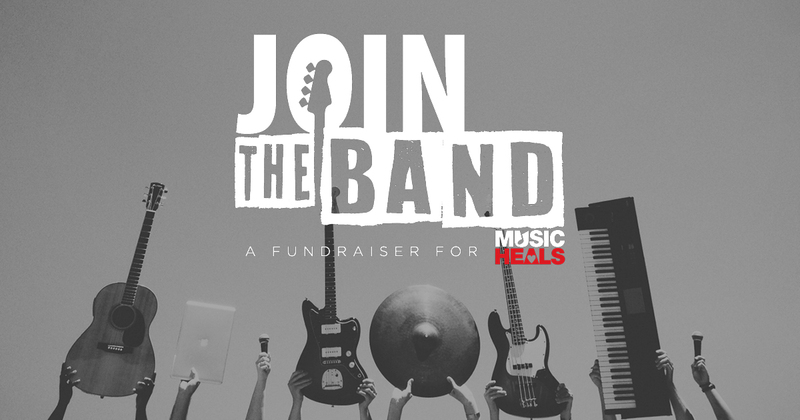 Are you a music therapist, music therapy intern, or a professional in a field related to Music Therapy that has something to share on the Music Heals blog? Submissions should include to links to your website and any social media channels you would like included in the article. 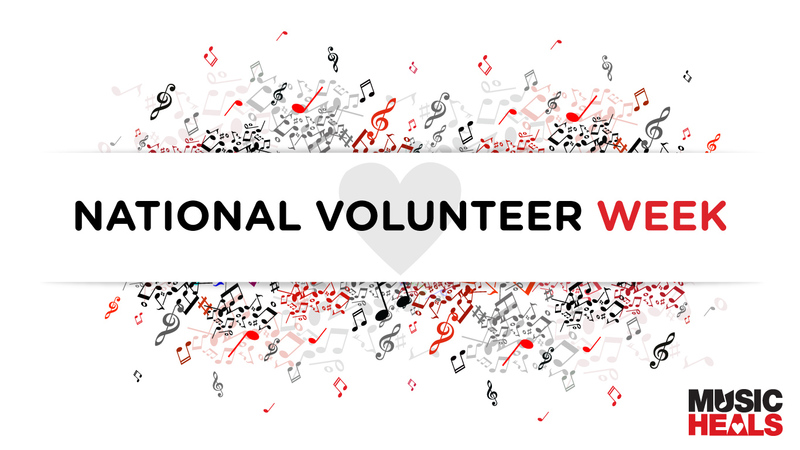 Happy National Volunteer Week to all our incredible Music Heals’ volunteers!